Detail : Paul's eleventh solo single. With "Band On The Run" still riding high, Paul was not tempted to lift another track as a single but instead wrote some completely new songs. These tracks were also recorded at the Nashville sessions, and were accompanied by Chet Atkins and Floyd Cramer. the B-side is a reference to a Country and Western singer that Paul met in Tennessee. Originally called Diane after the singer Diane Gaffney, Paul decided to change the title after she sued a paper for using her name without asking. he decided to "flip-it", re-promoting Sally G as the A-side on 7th February 1975. 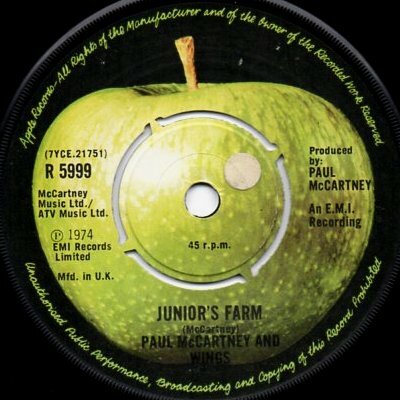 The single was not released in a picture sleeve and was the LAST Wings single to appear on Apple. which have a wider gap on the push-out centre and a hand-written matrix number on the run-out groove.